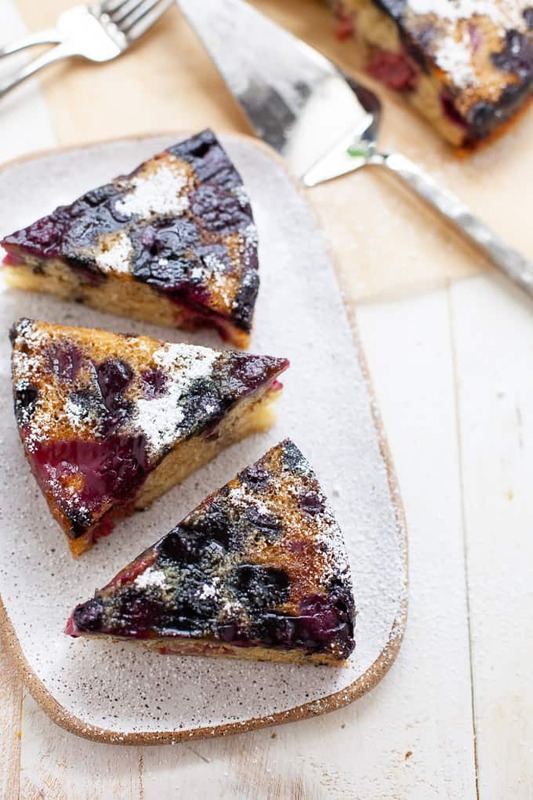 The perfect addition to your end-of-Summer gathering or companion to a cup of afternoon tea, this vegan berry upside down cake is dense, spongy, and combines fresh flavors such as olive oil and mint into a sweet symphony. Hey lovelies! I’m off to Italy for three weeks with my hubs and my fam (hoping pasta and gelato cure post concussive syndrome) so I have my two awesome interns popping on the blog to say hello while I’m away. 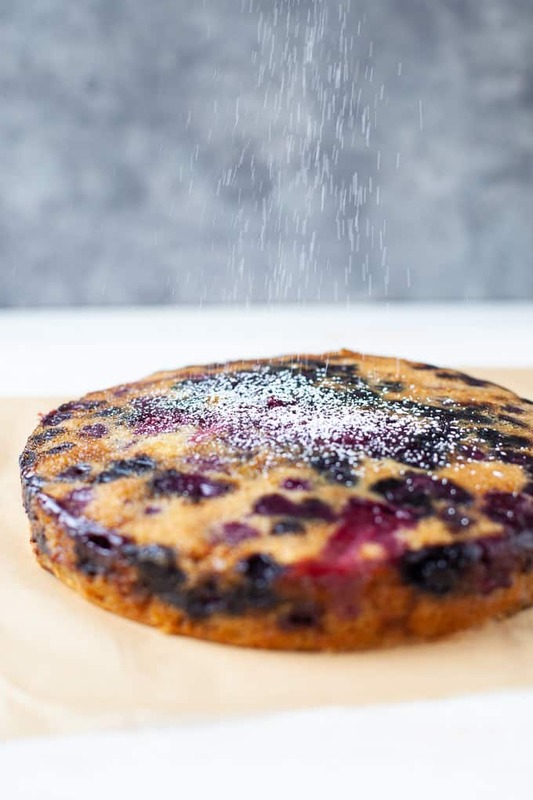 First up is Emily who created a mouth-watering triple berry upside down cake to share with you all just before the holiday weekend (hint, hint). Emily has been helping out BTS for the past couple months so I’m excited to introduce her to y’all. Take it away, Emily! Hello everyone! 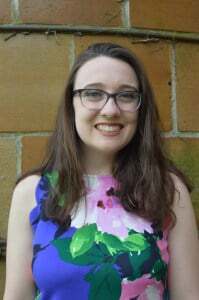 My name is Emily, and I am a new RD and Kara’s culinary communications intern. I am so excited to be writing this guest post and to be learning from someone I consider a dietitian rock star. I must say I was nervous when Kara asked me what recipe I would like to do for this post. I am in awe of her ability to create gorgeous recipes with seasonal flavors and ingredients that go together perfectly, simply based off of what she thinks might be good. My first food love was baking, more specifically, cake. As a 13 year old, I loved how all you had to do was follow the instructions, and stuff you had in your cabinet would turn to messy slop and then to a glorious dessert. For me, the creative piece was in the decoration. I liked using fondant and colors, and creating layers and crazy shapes out of cake. As I entered high school and then college, and schoolwork took up more and more of my time, I became more of a lazy cook and a reluctant creative. I tend to throw whatever I have on hand that I think will taste good together. I know how to make what I consider the perfect smoothie without measuring, and I frequently make pesto or hummus by just throwing good stuff in the food processor. Recipe, who’s she? For me, this creates the same kind of magic that I felt when I first started baking. But alas, here I am, needing to develop my own recipe. So I asked myself, what do I have on hand? Mixed frozen berries are a staple for me. I use them in smoothies, put them on toast, or just eat them straight. I will admit that I am a finicky fruit eater; I have no interest if it doesn’t taste flavorful and fresh. Frozen fruit is always sweet and delicious because it is frozen right after it’s picked. Also, an easy source of antioxidants (can you tell I’m a dietitian?). I also believe that extra virgin olive oil belongs on and in EVERYTHING. Using oil in a cake keeps it moist and dense, and using extra virgin gives the cake a certain depth of flavor that is hard to even describe. It also is a fantastic source of healthy fats (there’s that dietitian again). Fresh mint may not be a pantry staple, but I can grab some right out in my backyard. The front door outside of my family house in New Hampshire was surrounded with mint plants for as long as I can remember, and my mother took some to plant at home. The taste and smell reminds me of my childhood and this special place, picking and eating mint leaves straight off the plant. 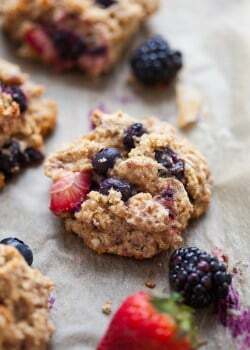 The flavor is subtle and fresh, not toothpast-y, alongside the berries. The other thing I love about this cake is that it is vegan, and therefore suitable for people with dairy and/or egg allergies as well. Unlike many vegan baking recipes, it doesn’t require expensive specialty ingredients and for some, even a trip to the store. It is single-layer and dense, perhaps even similar to a quick bread. 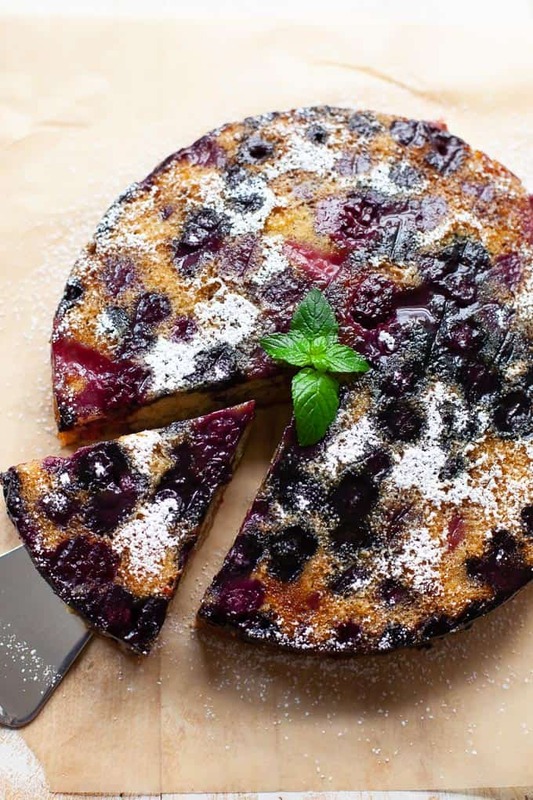 The cake below the berries is moist and rich, balanced by the freshness and sweetness of the berries and mint. It stays moist until the next day, so you can make it ahead of time to bring to your Labor Day party. Every time I made this cake while testing the recipe, my family made it disappear within just a couple days. I hope you enjoy it as much as we have. Bring mint leaves, sugar, and water to a boil in a small pot, then remove from heat and let steep 15 minutes. Preheat oven to 350 degrees F. Spray an 8-inch round pan with cooking spray, then line with parchment paper. Spray as much as is needed to allow the parchment paper to adhere to the pan. In a large bowl, combine flour, sugar, baking soda, and salt. In a small bowl, whisk together water, olive oil, lemon juice and vanilla. Pour wet ingredients into the large bowl. Whisk or stir just into no lumps remain. Brush the parchment paper on the bottom of the pan with mint simple syrup. 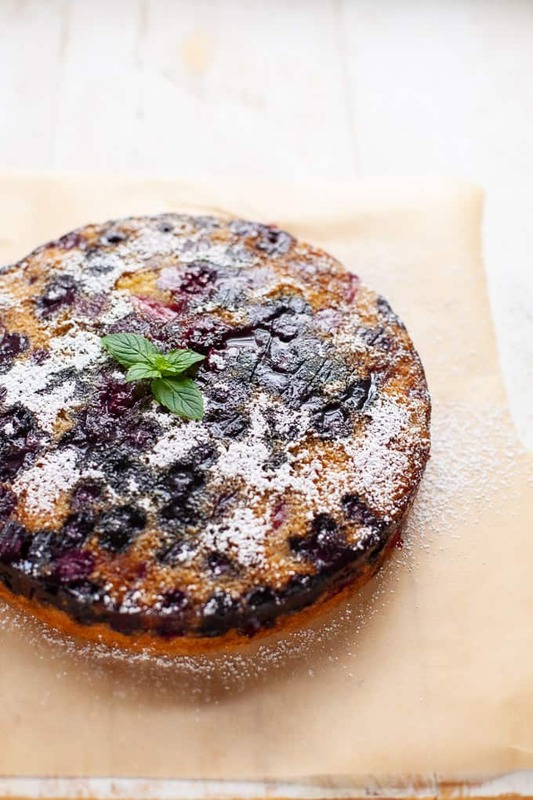 Add frozen berries to the pan, making sure the berries are evenly covering the bottom surface in a single layer. Brush the tops of the berries with more simple syrup. 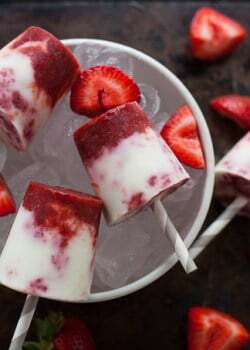 Gently pour prepared batter over the berries into the pan. Bake until a toothpick comes out clean or the center of the cake springs back when lightly touched, about 45-60 minutes. Let cake cool on a rack, about 30 minutes, then carefully flip the cake out of the pan and directly onto a serving plate. 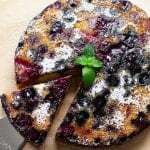 Once cake is no longer warm to the touch, dust with powdered sugar and finish with a sprig of mint leaves, if desired. 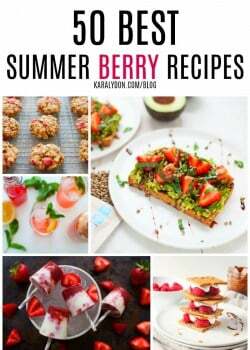 Check out these other great berry recipes below! 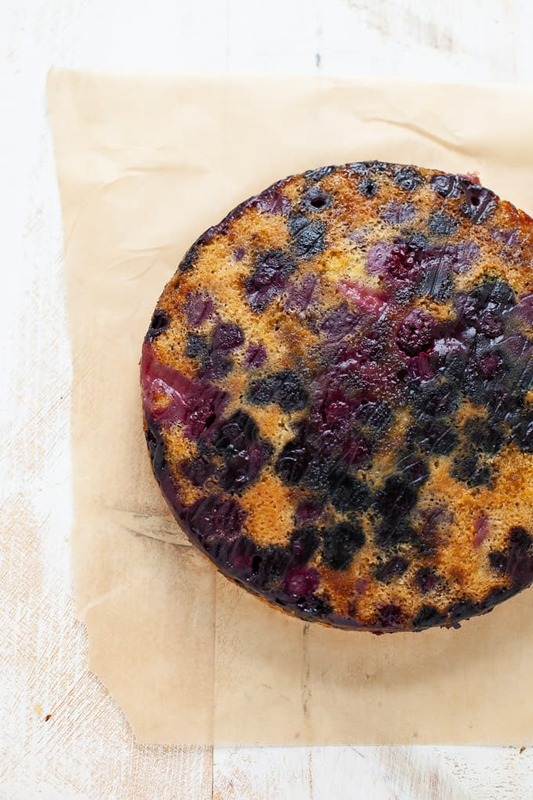 Have you tried this on a smaller scale in muffin pans? I haven’t tried that Nicky but if you try it, please report back and let me know! Needing this in my life! So beautiful AND delicious! Saving this for our next brunch! Beautiful cake and I love the addition of mint syrup on top! I just realized if I had a different last name, I would be EAT too! 🙂 Have a wonderful trip Kara~and if you get to Greve in Chianti (in Tuscany) be sure and try the Cremino Gelato at the town cafe~my mother-in-law and I swear it’s the best gelato flavor ever!! Haha love that! Oh my gosh now I’m regretting not making it to Chianti!! Yes, thank you to my intern Emily! 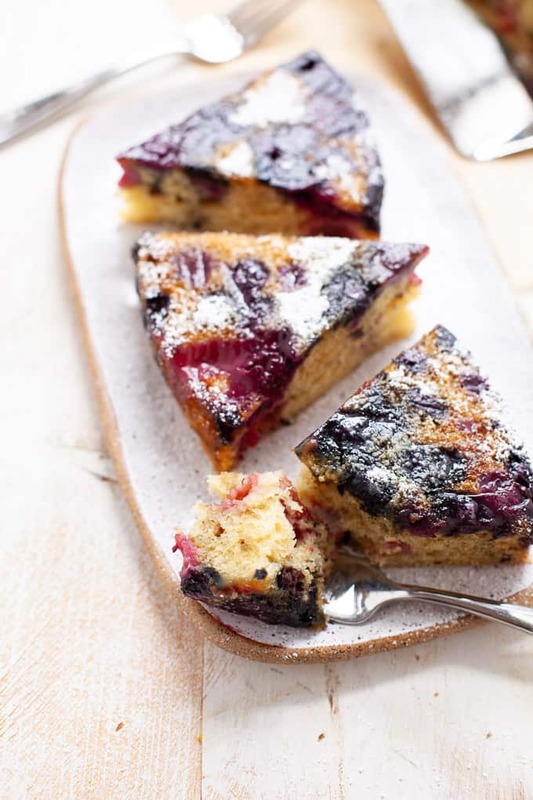 I think upside down cakes are so delicious and this one with berries is perfect for this time of year! This is just so pretty! And so fitting for this weekend. Looks gorgeous and sounds delicious! Perfect for a Labor Day weekend party! This looks so yummy! And the mint syrup sounds like the perfect addition to it!